The 11th of February 1929 witnessed the signing of the Lateran Treaty, under which the Kingdom of Italy officially recognised the independence and sovereignty of the Vatican City. It brought to an end the “Roman Question,” a political dispute that had divided Italy and the papacy since 1861. The dispute was born out of the process of Italian unification that took place in the latter half of the nineteenth century. Under King Victor Emmanuel II, the newly-created Kingdom of Italy proclaimed Rome as its capital. This was seen as a threat to the Holy See, which refused to accept Italy’s claim on Rome. Though Italy proclaimed Rome as its capital in March 1861, it was not until 1870 that Italian troops finally entered the Eternal City. The following year, attempts were made to appease the Holy See in recognition of loss of territory, but the terms of the Law of Papal Guarantees left Pope Pius IX feeling vulnerable, and he refused to accept the proposal. He was concerned that the decree, unilaterally imposed by Italy, left the Papacy subordinate to Italian law and threatened its independence. He was determined that the Pope should not be reduced to the role of personal chaplain to the Italian King. From this time on, the Pope became known as the “prisoner of the Vatican,” as the lack of diplomatic immunity meant the Pope could not safely leave the confines of the Vatican. The situation remained unresolved for the next fifty years, until steps were made to find a satisfactory compromise in 1926, under the regime of fascist Prime Minister Benito Mussolini. The self-styled Duce considered it desirable to reach a deal with the Papacy in order to give legitimacy to his leadership. Without the backing of the Catholic Church, many Italians were still loathed to accept the existence of the unified Italian state. After several months of negotiation, a document containing 27 points was drawn up that was acceptable to both sides. The primary element of the treaty was the recognition by the Italian Kingdom of the full independent status of the Vatican City. In return, the Vatican would accept the legitimacy of the Italian Kingdom, its lawful sovereignty over the former Papal States, and Rome as the Italian Capital. Other caveats were included in the treaty, including the commitment by the Italians to build a railway station in the tiny enclave, and the commitment to provide a constant supply of running water. The Pope’s representative Cardinal Gasparri and Benito Mussolini signed the historic treaty in the Lateran Palace, and it was ratified by the Italian King Victor Emmanuel III and Pope Pius XI some four months later. With the signing of the treaty, the Roman Question was finally resolved and the sovereignty of the smallest state in the world was guaranteed. Subsequent regimes have upheld the decrees of the Lateran Treaty, and the Vatican City, with an official population of under a thousand, retains its independence to this day. 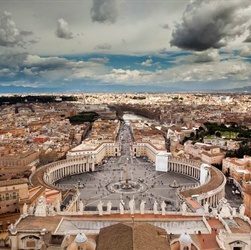 Photo Caption: With the signing of the Lateran Treaty, Vatican City became the smallest state in the world with a population of under a thousand.